The design(s) are printed on a specially coated paper, a carrier (cover-coat, which disappears during the firing process) is printed over the design that allows the print to slide off after wetting. For best results clean the ware to be decorated before applying the Waterslide Decal transfers. The decorating surface must be clean and free from any grease, dust or dirt particles. This is to ensure proper firing and bonding between the decal and the surface/substrate. Any dust, dirt or chemical on your substrate will have an unwanted effect on the fired product. Carefully cut around the printed design (if provided on a full sheet) OR each decal will slide off the paper individually. 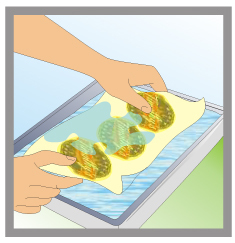 Fully immerse the decal transfer in a shallow pan of clean cool water and soak for about 10 -15 seconds, so the paper is completely wet. Remove from the water and wait for 60 - 90 seconds (or until the decal can be released from the backing paper.) Warm water can be used for moulding the decal on irregular surfaces. 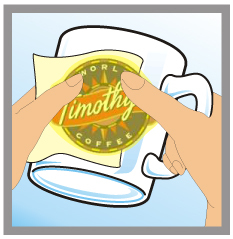 The decal should easily slide away from the paper - avoid soaking the decal too long, otherwise it may release itself from the backing paper and float in the water, making it difficult to handle. The soak water should be changed frequently to reduce impurities and water soluble gum that builds up in the water. The decal can now be applied to the ware (as printed, face up) in a couple ways. Method #1: (For Very Large Decals) Apply decal over the object face-up, and slip out the backing paper from underneath. 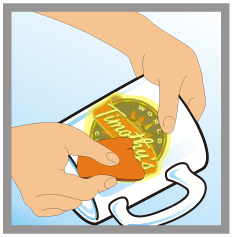 Adjust the positioning of the decal on the ware/substrate and remove water using a rubber squeegee. (We recommend using a squeegee with a medium flex.) This is accomplished by patting down from the center toward the outer edges until all excess water has been removed and wrinkles and air bubbles have been smoothed out. Method #2: Remove 10 to 12 decal sheets from the pan and place them face-up on a coupe plate or shallow dish. Slide decals off the paper with a finger (do not “pick”) and apply each individually to the ware. Straighten the decal and remove water as described in Method #1. When all of the decals from the top sheet have been removed from the backing paper, discard the backing paper and begin using the decals from the next sheet. Allow decorated pieces to dry thoroughly. Allow to dry for at least 2 hours in a warm area or overnight before firing to allow all moisture to evaporate as any moisture left behind will cause blowouts in the design during firing. The transfer is now ready for firing. Allow sufficient spacing between your wares, to allow heat to circulate. Higher firing is for ceramic/porcelain applications. 735 - 770ºC (1360 - 1420ºF) or Cone 017. For best results, allow decorated ware to thoroughly dry before firing. These temperatures are by no means absolutes and we therefore suggest that you request samples to try on your wares under your conditions. Firing conditions and substrates will vary and will have varying results. 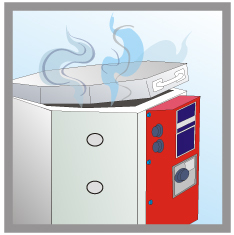 Under optimum conditions, the firing cycle should be slow and well ventilated. Please note that we cannot take responsibility for the lead and cadmium levels of the ceramic/glass decals when fired. Unless otherwise stated please DO NOT decorate on surfaces that come in contact with food or drink. Please see our regulations page. We also will be stocking Lead-Free colors in the near future. If decals are used on food-bearing surfaces, we strongly suggest that the products be tested to comply with FDA and state rules. One of the greatest problems in the storage of decals is sticking of the wax paper to the decal. We recommend storage of the decals in air-conditioned rooms (humidity 55-65% moisture) and on the decal paper's EDGE. Decals should be stored at a constant room temperature of approximately 68-74ºF. With proper storage, the decals have a shelf life of 1 - 2 years. Some colors may be effected over a longer period of storage.